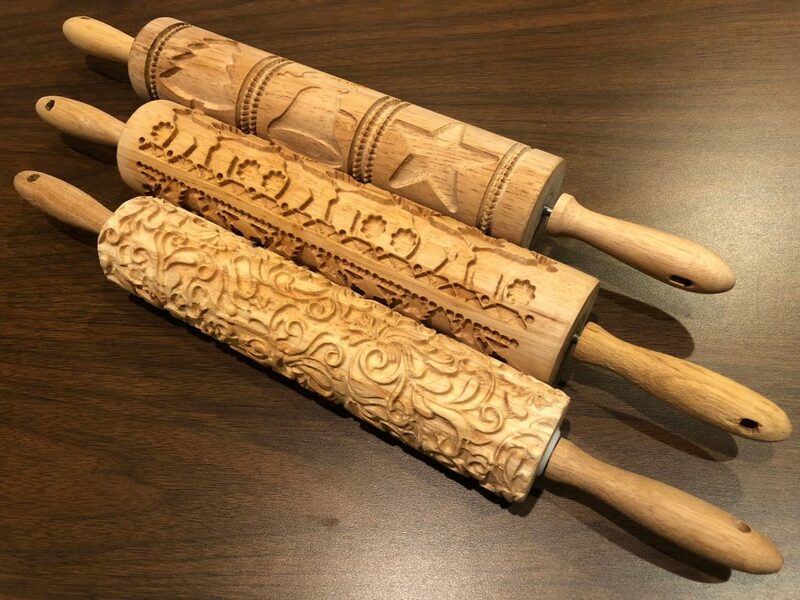 Have you seen these rolling pins with designs carved into them for embossing cookies? If you haven’t seen them, they are very popular on sites like Etsy and Pinterest, and you should check them out. 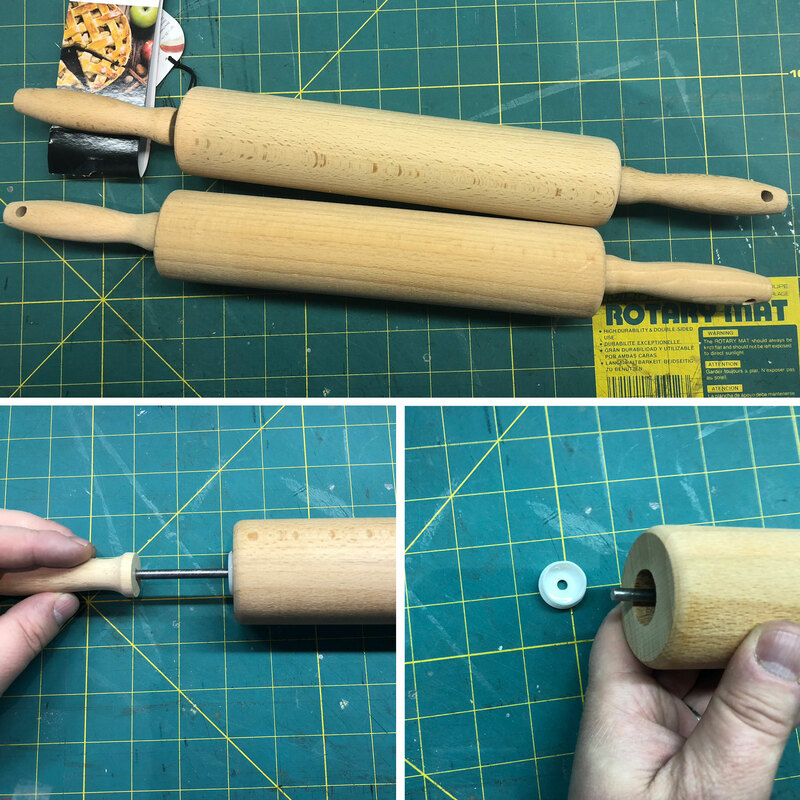 Recently, they came to my attention and I immediately saw the potential of making embossed rolling pins on the CarveWright with the Rotary Jig. 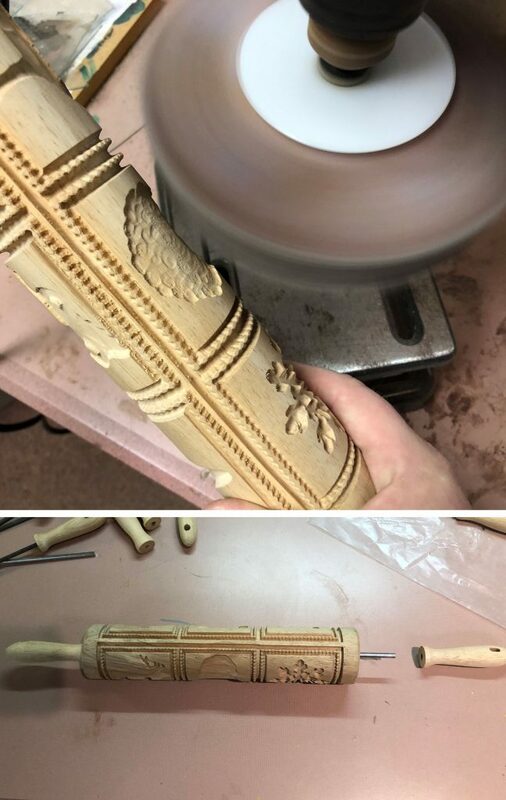 Turns out, carved rolling pins have been around for quite some time. 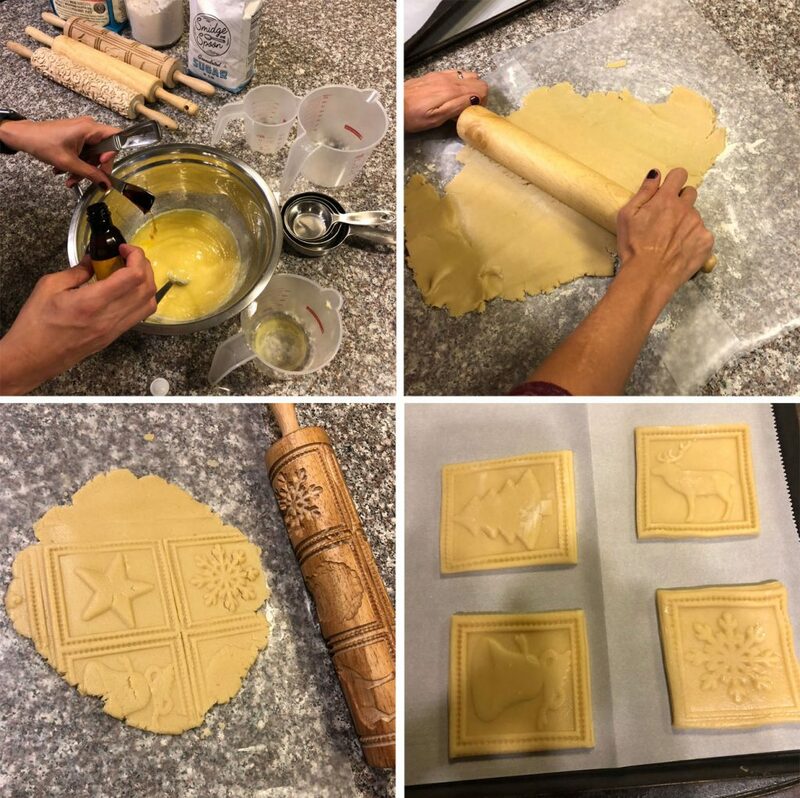 The Germans have been making their Springerle cookies since at least the 14th century with either a carved rolling pin or embossing mold. People have been rediscovering this process lately and the internet is full of experimenting with recipes and techniques. I was excited to do my own experimenting, so I set out to gather supplies and start designing. First, I needed to decide what material to carve on. That ended up being an easy decision, since I went down to Walmart and found rolling pins all nicely pre-made for me at $4.99. I inspected them and found they had 3/4″ holes with plastic inserts on either side. I could remove the handles easy enough, but I would need to do something about those holes. Rotary jig blanks from the kitchen isle. At the Lowe’s store down the street, I found some 7/8″ diameter wood dowel. I figured I could make some pegs to wedge into those holes and then measure and drill my centers. Once the glue from the pegs was dry, I cut off the excess with the band saw and sanded the ends flat. Then, with a center finder, I marked the centers so I could drill the 3/16″ holes needed for mounting into the Rotary Jig. The blanks are marked, drilled, and mounted into the Rotary Jig. My material is prepared and I have their measurements, but what to carve on them? 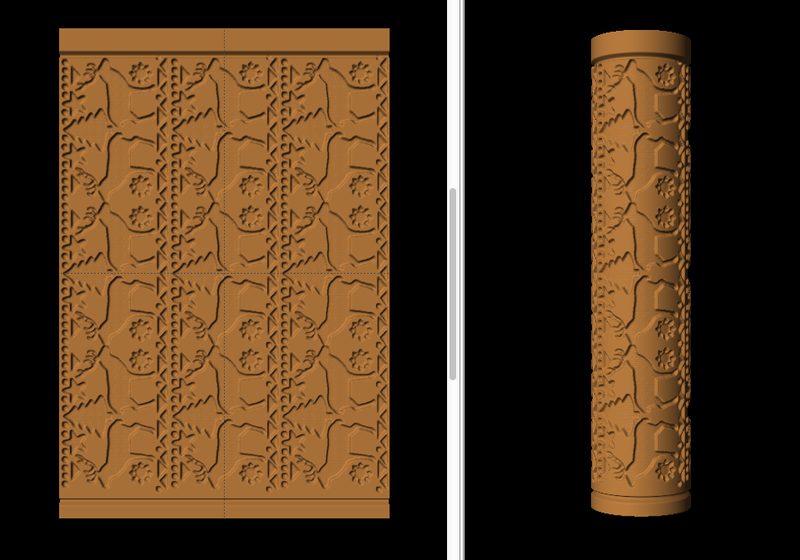 Inspired by the old-world Springerle cookies, I based my first design on their traditional rectangular patterns. 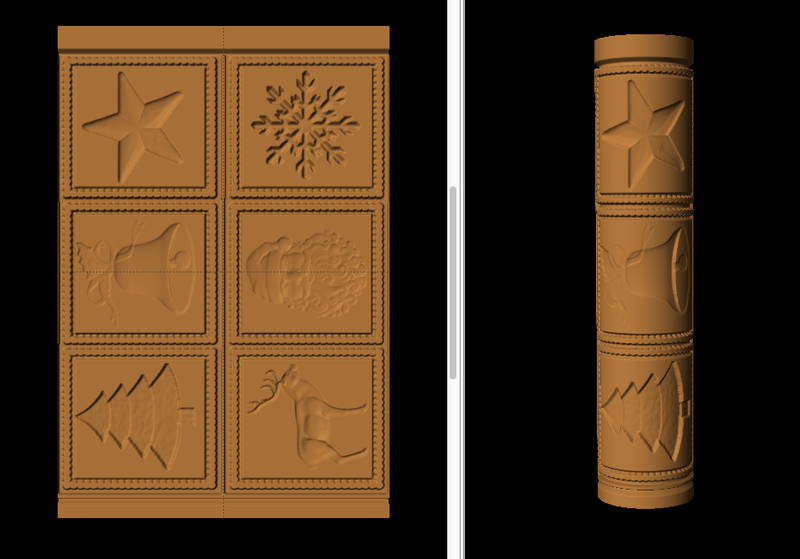 I found some Christmas patterns on the CarveWright Pattern Depot and inverted them into the rectangular shapes. 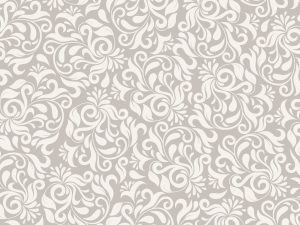 You can use any patterns you want in this simple design. 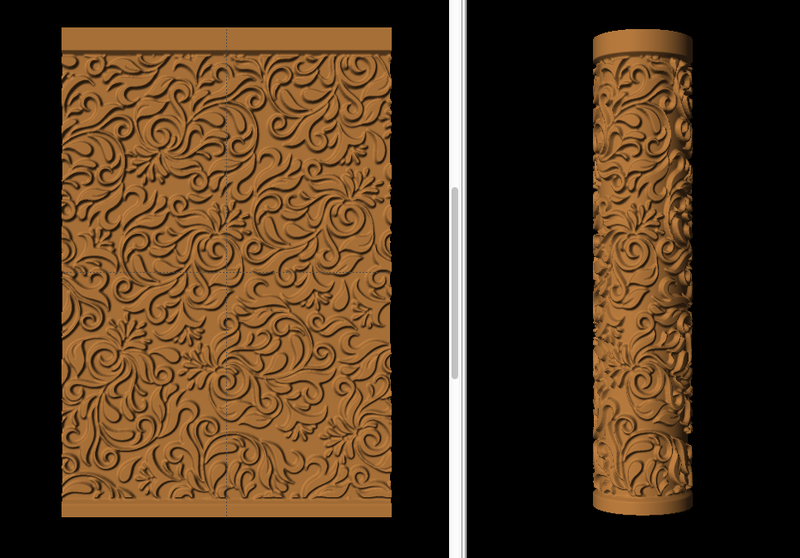 Next, I found a floral pattern image online and imported it into the CarveWright Project Designer software. Once in my pattern library, I simply placed that design on my rotary project board and adjusted the depth to be about 1/16″ deep. NOTE: I experimented with some different depths and optimization levels, so let me save you some time and tell you what I found. If your carving is too deep and if you don’t have a draft, the dough will get stuck in roller and it won’t work well. PROJECT DIMENSIONS – I found there was variation in diameters of the rolling pins from 2.125″ to 2.25″. Make sure you are measuring and adjusting your project accordingly. Don’t assume they are all the same. DEPTH – The depth may vary from machine to machine, but I found that between .06″ and .08″ is likely were you want to be. Start at .08″ and adjust shallower if necessary for the next carve. BIT OPTIMIZATION – Set patterns to “Bit Optimization: Best”, unless inverted. Bit optimization works in reverse on inverted patterns. DRAFT – Like any other kind of molding, you will need to have a pretty good draft to get the mold to release from the dough. I went with a “Draft: Medium” on these and it seemed to be enough. If you are inverting a pattern, follow these steps to add draft. Use the “Rectangle Tool” to draw a region around the inverted pattern. Make that rectangle a “Carve Region” and set the Depth to “0”. Give the region a “Merge Style: Additive”. Then set the “Draft: Medium” to the carve region. 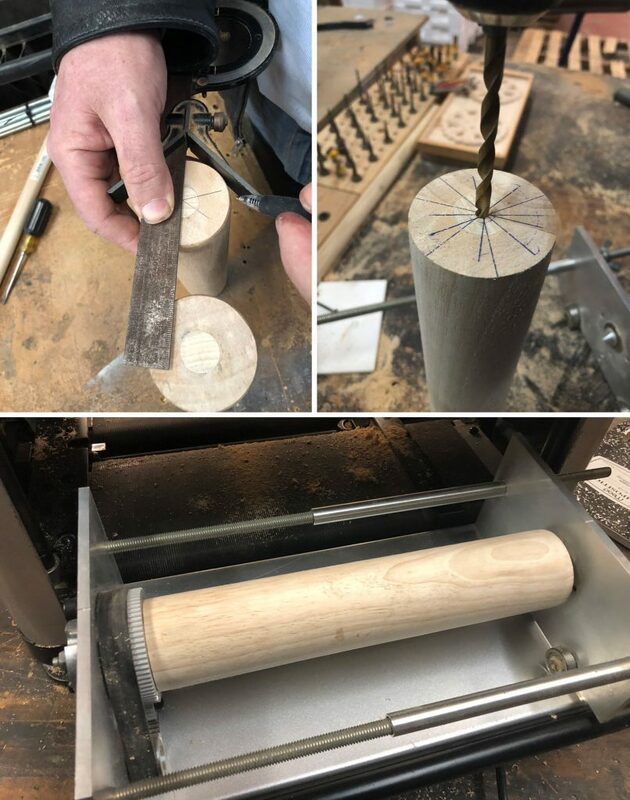 With your project files finished and uploaded, load your Rotary jig into the CarveWright, making sure you have it installed correctly. Then, run the rotary calibration a couple times to make certain your system is ready. Once calibrated, run the project and start thinking about delicious cookies. I’ve been asked to include more carving videos in my articles so people can see more of the action. Well, here is some action. The carve times for these projects was a little more than 1.5 hours each. 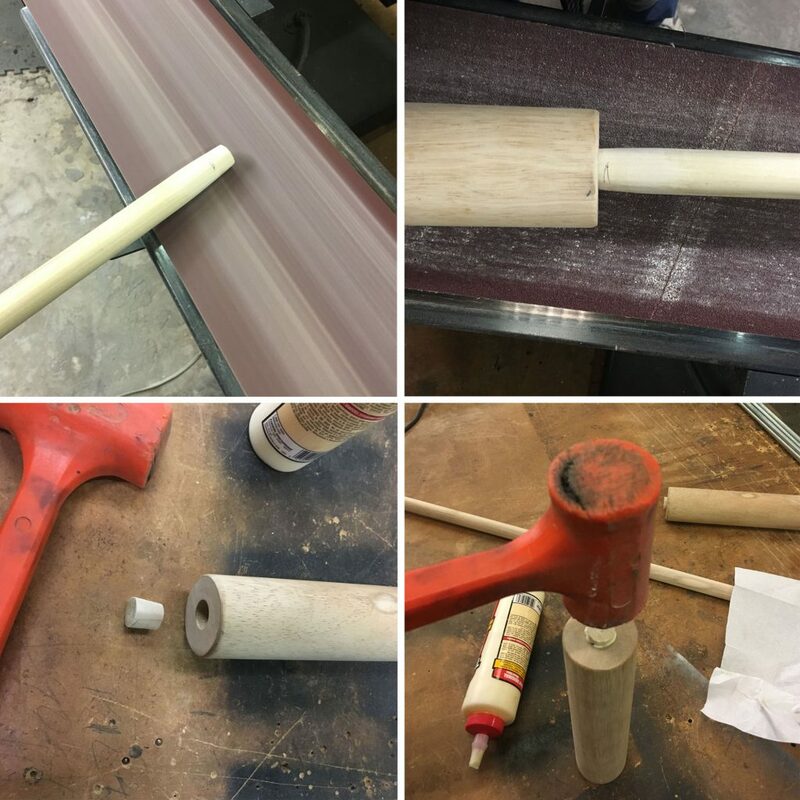 When the rolling pins came off the machine, they needed very little cleanup. A couple passes of the sanding mop sanded them up pretty good. You may need to use a dremel or some files to get into tight areas, but likely, not much. Once sanded, just re-attach the handles. That’s it. All we have to do now is make cookies! My wife helped me with this part, thank you meu amor! We found a recipe online that promised to give us good results. 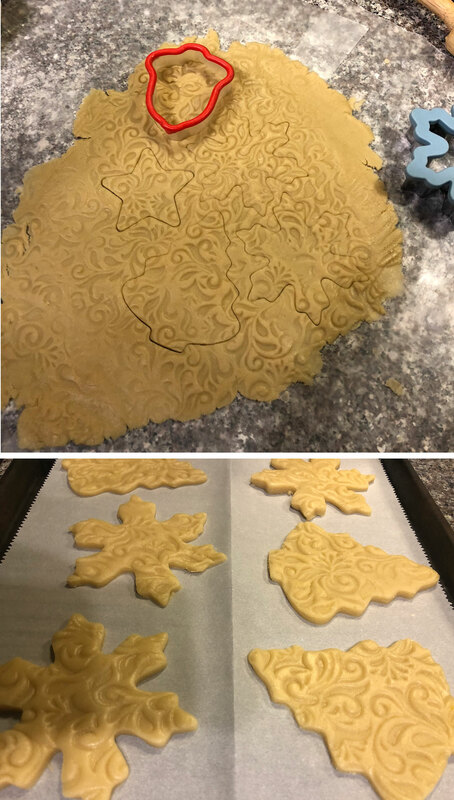 You see, if embossed cookies rise too much, they will puff out all the details, so we can’t just use any-ole dough off the shelf. During the online hunt we found that shortbread and gingerbread cookies seem to be the most popular and successful choices. We used this excellent recipe we found on KingArthurFlour.com. Mix your dough, roll it out flat, and roll on your emboss design. 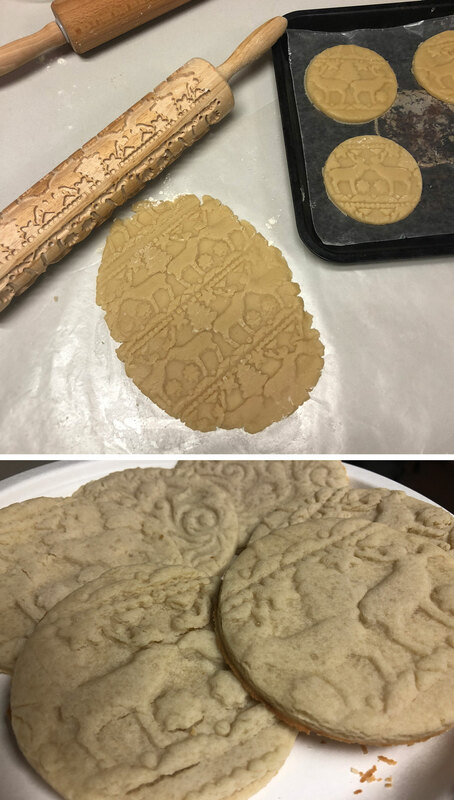 Use cookie cutters to cut shapes out of your embossed dough. There are a number of ways that people are decorating these types of cookies online. I’ve seen them with simple glazes and sugar sprinkles to hand painted with edible gold. I’ll let you decide how far you want to take that. Note: I learned a couple things while doing this that I think is important to pass on. Flour The Dough – The recipe says after the dough is rolled out to about a 1/4″ thick, light dust with flour. This is very important. The dough will want to stick to the roller and the flour helps it release. Roll Towards Yourself – We seemed to get better results when we rolled towards ourselves as opposed to away. It worked both ways, but towards was slightly easier. Hold Down – The wax paper we had the dough rolled out on kept trying to slide when we rolled. One had to hold the paper in place while the other rolled out the design. Don’t Push Too Hard – It will likely take a few tries to get the right amount of pressure, but just don’t push real hard. It will bite into the dough too much and grab, making it stick to the roller. Everyone at the office was excited to see and try the cookies, but were disappointed when I didn’t bring any the next day. They weren’t disappointed for long because I had a surprise. I had designed and carved a third rolling pin, and had brought dough with me to make cookies at the office. Ugly sweater cookies for all! 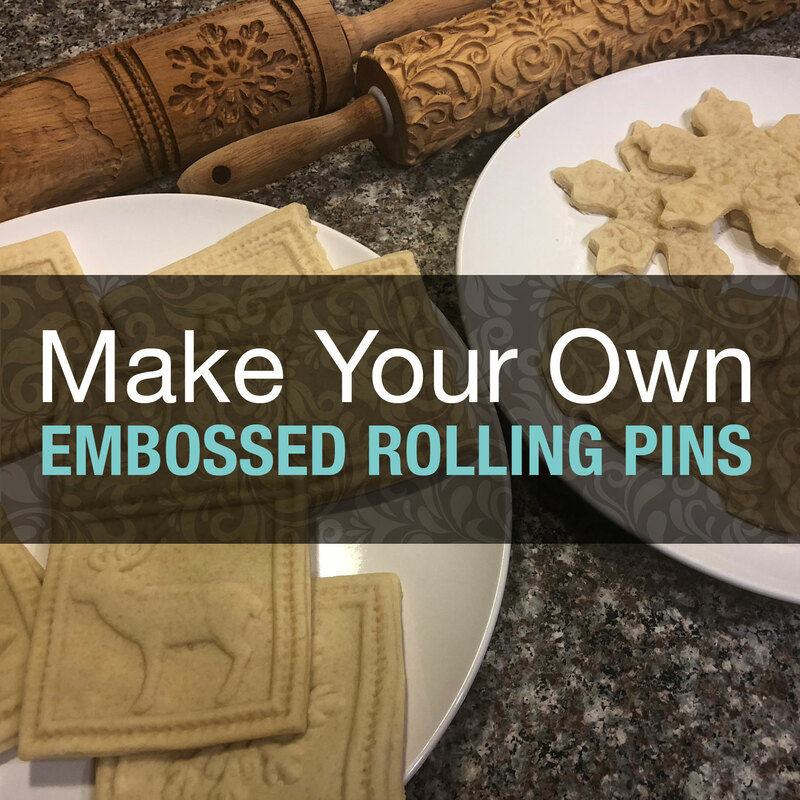 I hope this inspires some of you to make your own embossing rolling pins. There are just so many possibilities for these. You can make really cool themed cookies for literally anything. Carve names in for birthday or wedding cookies. I’ve seen Star Wars and other pop-culture designs. I even see these being use for cake decorating and pie crusts. All in all, this was a amazingly simple and fun project that I will enjoy using and gifting this holiday season. This entry was published on November 20, 2018 / Joe Lovchik. 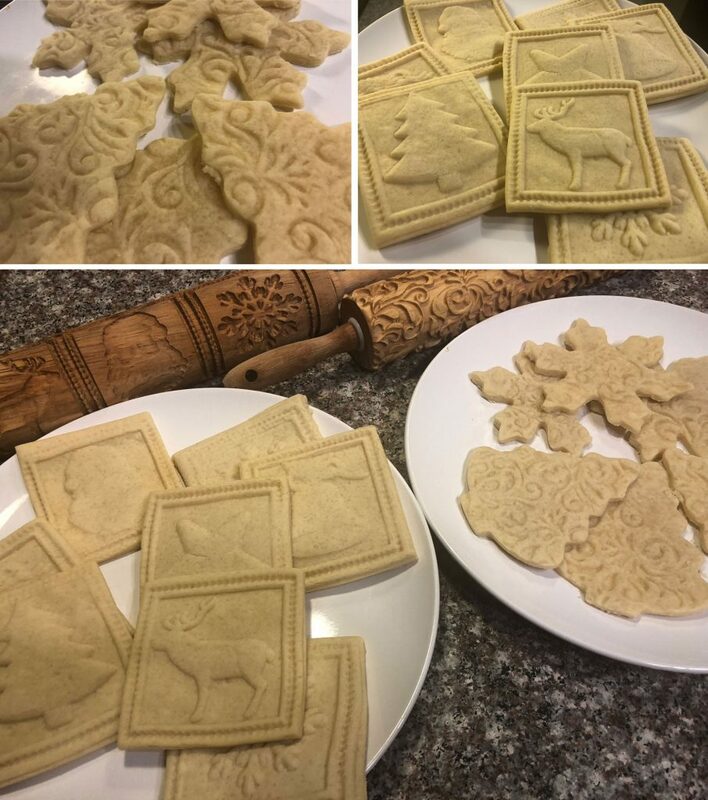 Posted in The CarveWright Build Blog and tagged baking, cookies, embossing, mold making, rolling pins, rotary jig. Bookmark the permalink. do the rollers needed to be treated with anything to seal the wood? Not that I found. This was another reason for using an existing rolling pin. They are already food grade. Super-fun Rotary Project, Joe! Thank you for the detailed info and instruction! substitute a silicone mat for wax paper for a non-slip/non-stick surface. This is really fascinating. The rolling pins would certainly make a unique Christmas gift. Great craft fair project also. It’s off to Walmart tomorrow! Thanks for including the recipe and tips.